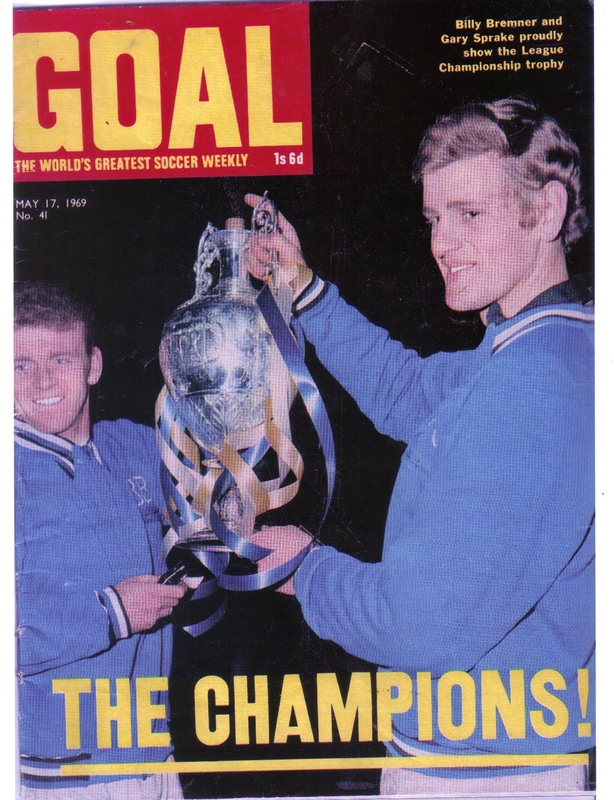 2019 marks fifty years since Leeds United were crowned Champions of the Football League for the first time. It happened on a wonderful night at Anfield, Home of Liverpool Football Club in 1969 and I was there. Coming into final stages of the season we had only seen defeat twice: once at Manchester City two nil and a surprising five one defeat at Burnley which we avenged six one at home. Liverpool led the league all through the season but we had matches in hand – dare we say it – it looked as though we might make the coveted championship at last! One mighty barrier had to be breached first and that was Liverpool themselves at Anfield. This was to be the big one, the match that I shall remember when all others fade. I want to take you with me on that trip to Anfield on that wonderful April night. We left work early that April night and slogged it across the Pennines, and it was a slog in the days before the M62 Motorway was constructed. There was going to be a capacity crowd in Anfield that night, a draw would do for us to lift the Champions crown but if we lost then Liverpool themselves would likely keep the trophy they already held. We called at a shop for the traditional meat pie on the road that leads past Stanley Park; when the lad behind the counter heard our accents he wished us good luck, ‘Can’t have that lot up there getting too cocky’, he said. Obviously he was a staunch Evertonian. We were already in the ground by five thirty, it was like a great empty cathedral, in fact there was so much space and so long to wait before the kick-off that the four of us who made the trip drifted apart and were not united until the end of the game. One of our number, was a girl called Irene, she was the most fervent supporter of us all, she had been in Hungary for the Ferenvaros match the year before. So keen was Irene that she had written into her contract of employment that she could have time off to watch Leeds United and to have her office painted blue white and gold. She was later to fall foul with the authorities at Elland Road for allowing her banner to fall across the advertising boards. To return to Anfield: it was smaller than I had imagined it would be; the field seemed toy like and even the Kop directly across from us did not seem as immense as I had been led to believe. It was a spring evening which allowed the sun to shine directly into our eyes; it was so brilliant we could hardly see a thing. Perhaps we would be so blinded we would not be able to see the game. Anfield at that time was modern on three sides; the fourth side looked strangely quaint with its rounded timber fascia painted in red with the white letters: Liverpool FC. What an aura of tradition abounded the place. Leeds players came out to inspect the pitch in their lounge suits. In the streaming sunlight on that small elevated pitch even Billy Bremner looked tall; how giant size would the Liverpool players look when they appeared? Leeds had a good following that night, with the chance of history being made and Leeds lifting their first major trophy what Leeds fan would want to miss out on a night like that? Almost all our end belonged to the Leeds support but somehow I had managed to become surrounded by Liverpool fans and what a great lot they turned out to be! They were a little shocked to hear our lot chanting the songs, they themselves, had made famous but with an added sprinkling of our own obscenities. The match progressed as I had expected – Leeds had come for a point and played seventy five percent defensively. It was about quarter time before I announced my presence in the midst of a little pocket of Liverpool regulars; they seemed a little surprised to find a Leeds fan amongst their ranks, especially as I was shouting for the removal of a certain Liverpool player who had fouled. ‘Gerr ‘im off!’ but as I stated before, they were a great bunch; as they saw me sweating for the one point we needed for the championship they consoled me by comforting: ‘Only forty minutes to go lad’ – then, ‘Only thirty minutes now.’ It takes greatness to bestow such comfort, especially as our success would mean their failure but then Liverpool were well versed in success, and this was only our ‘maiden voyage’. As the time became shorter our fans shouted madly, ’Liverpool – Liverpool – runners up!’ It was so unnecessary, so pretentious a single Liverpool score even at that late stage and the dream would be over. I remember little of those final few minutes the tension was making it all a blur. But I do recall that the lads were dribbling the ball off our very goal-line, they did not resort to belting it up field, I would have been happy if they had put the ball into row ‘Z’. Then Alun Evens was through with only Sprake to beat, the goal seemed as wide as a field he couldn’t miss but miss he did. I daren’t look at my watch I knew if I did that would surely put the mockers on it. But for once the gods were with us – they didn’t pass that night. When the whistle did sound it was a little unexpected and a little unbelievable: our little team from Elland Road that I had supported from a lad, all those ordinary years in the second division were champions of the Football League! The Leeds players congratulated each other and were congratulated by the Liverpool team, and then they ran to our end to be treated to hysterical applause. That done they started back to the tunnel; Mr Revie was on his feet and waved them away to the Liverpool Kop; the lads made their way, almost shyly to the famous Kop, hallway across they stopped and waved at the massed ranks of Liverpool fans. That which happened next was the highlight of the whole season and as it seems to have turned out, the highlight of my whole lifetime of watching Leeds United. The Kop arose in a mighty salute of red and white with the thunderous acclaim: ‘Leeds – Leeds – Leeds’. The Kop, which had seemed smaller than expected when entering the stadium, was now a colossal cathedral filling the whole panorama; the crescendo was a magnificent sight, enough to take the breath away. Any Leeds fan who remained dry eyed that night had to be a hard hearted beggar! We left Anfield treading air, the pubs and fish and chip shops all the way from Liverpool; to Leeds (remember there was no motorway) were filled with delirious Leeds fans. Att: 53,750.Score Liverpool nil – Leeds United nil. Leeds: Sprake, Reaney, Cooper, Bremner, Charlton, Hunter, O’Grady, Madeley, Giles, E, Gray. Liverpool: Lawrence, Lawler, Strong, Smith, Yeats, Hughes, Callighan, Graham, Evens, St John, Thompson. This entry was posted on April 1, 2019 at 12:19 am and is filed under East Leeds. You can follow any responses to this entry through the RSS 2.0 feed. You can leave a response, or trackback from your own site. Thank you so much Peter. Your account captured the excitement and exhilaration perfectly. I read it almost as if I were there myself. And it came at a perfect time for me, my coffee morning with my friend Denis a Watford Football Club supporter. I am longing for Leeds United to get up there into the premier’s league so that Denis and I can have a “shoot out” when Leeds play Watford next year. What a tale and what a thrilling experience it was. A fantastic post! All I remember about it is we won and we got the most points ever! The event that really stood out was the following year and that appalling defeat at Hillsborough to Chelsea. Great to see Cooper’s name there – he was our family’s favourite player; coincidentally, he lived next door to my wife, who grew up in Brotherton. Let’s hope God gives us a chance at the premiership next season. He’s certainly talking to Pablo Hernandez. Wow, talk about capturing the atmosphere. Like Doug , I almost felt as though I was there, feeling a little nervous excitement even though I knew the result beforehand. It was also good to hear of the friendly atmosphere which obviously added to the pleasure & lasting memories for you. Thanks for your comments, guys, I can see we are all kindred spirits. 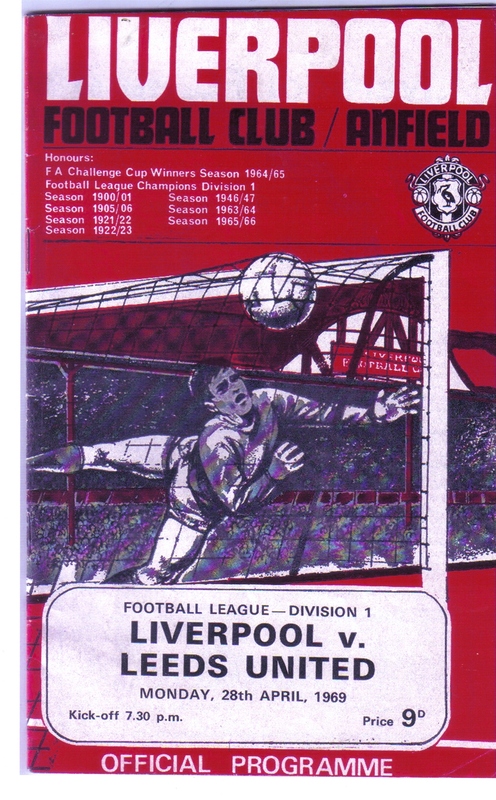 Yes, Mark those two finals against Chelsea the Wembley one and the replay at Manchester hurt, we were in front in both but ended up losing but we won in 1972 didn’t we., Did you notice the price of the programme on ‘The Night at Anfield. nine old pence that’s about threepence halfpenny in todays money now they cost quids. Some great memories Pete, although I must say I’ve never been a dedicated fan of Leeds United the era you mention was a great period for both the team and fans. To have the acclaim of the mighty Kop is a great tribute to the game and it’s supporters. I worked for a couple of years in the Liverpool area during the late 60’s and the early 70’s, and I always found them to be a friendly group of people, although they could get a bit touchy on the subject of football. It is amazing when you recall the price of things in those days, if you had a 10 shilling note in your pocket you were well off, today it’s nothing, 50 p. Thanks again for a great tale well written and well presented. You’ll like this (not a lot) Following on from this tale another Leeds fan had a less successful night at Anfield. He was in the kop end amongst all the Liverpool fans, when there was a goal mourh incident the whole crowd surged forward (like used to happen before grounds became all seating) when they surged back he found he had lost a shoe – never retrieved it – a the end of the match out on the street some Liverpool fans said, ‘Are you a Leeds fan? and chased him down the road one shoe on and one shoe off. in panic he ran into a house and asked them to rescue him. They did and gave him his tea.